By David Skolnick | June 27, 2012 at 12:01a.m. 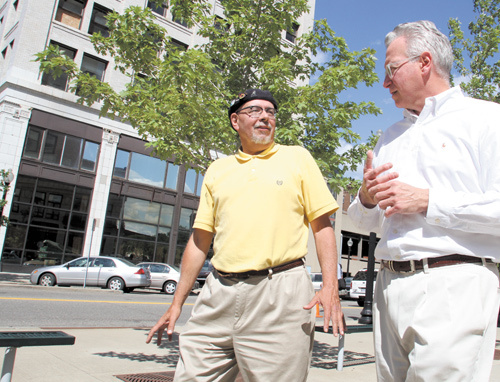 Ron Faniro, left, a local architect, talks with Ed Jerse, director of the Regional Collaboration of Cuyahoga County, during a walking tour of downtown Youngstown. Faniro, of Faniro Architects, served as tour guide Tuesday for members of the Northeast Ohio Sustainable Communities Consortium, who visited portions of the city to get a better understanding of Youngstown. A Northeast Ohio consortium has created a website that, its officials say, is designed to help the area’s residents and elected officials better understand the region’s challenges and research solutions for its future. The Northeast Ohio Sustainable Communities Consortium unveiled the site — cat.neoscc.org — at its Tuesday board meeting at the Covelli Centre. “Our objective in creating an online living document rather than a static, printed report is based on the fact that we all have a lot to learn from each other about what is going on in the region, especially what is going well and what is challenging,” said Jeff Anderle, the organization’s manager of communication and engagement. 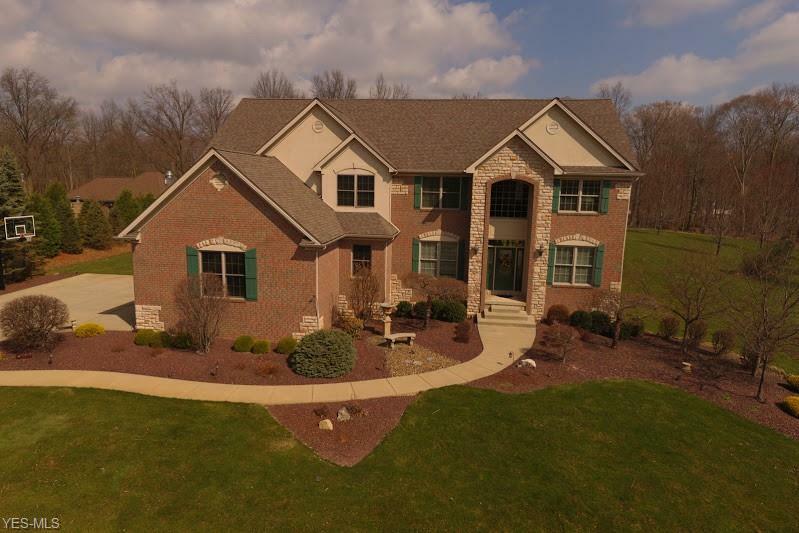 The website includes information about land use, economic development, the environment, housing and transportation in 12 counties: Mahoning, Trumbull, Ashtabula, Cuyahoga, Geauga, Lake, Lorain, Medina, Portage, Stark, Summit and Wayne. “The next step is to develop plans and solutions using best practices from communities and groups in the region,” Anderle said. The consortium, consisting of about 100 organizations, is having a monthly public meeting in a city in each of the 12 counties, and started Tuesday with Youngstown. Also Tuesday, members of the consortium’s board walked through portions of the city — including downtown and Mill Creek MetroParks — to get a better understanding of Youngstown. The consortium created the website using public policy plans, planning initiatives and other reports. Findings are included, but no recommendations, Anderle said. The recommendations will be developed in collaboration with area leaders and residents, he said. “This platform is a beginning, not an end,” said Jason Segedy, the consortium’s board chairman. The website identifies the benefits and challenges of the region. Examples under economic development include: the region as strengths in emerging industries; has a relatively low net job growth, but employment has become more widely dispersed; and lacks comprehensive data of the locations and conditions of its brownfield sites that haven’t received money from the state’s Clean Ohio Fund. “We can add, change, subtract [from the website] as NEOSCC continues its work and as residents contribute their perspectives,” Anderle said. June 26, 2012 3:06 p.m.
July 25, 2012 12:07 a.m.